The creation of St. John Gualbert is the product of a happy accident. In 1888, Dean John Pitass of St. Stanislaus Church was informed by the United German and French Cemetery that Poles would no longer be able to be buried in their graveyard. Pitass began looking for a property that could be turned into a cemetery for the Poles. He found a 22-acre farm in rural Cheektowaga and paid a $5,000 deposit. Shortly after making the down payment, Dean Pitass learned that the city of Buffalo passed a law prohibiting new cemeteries within five miles of the city center. With the center of Pittass’ land at 4.8 miles from downtown, the priest decided to buy the farm himself and look for another location for the parish cemetery. For 26 years the Pitass Farm sat and in 1913 Dean Pitass passed away. His parish’s successor was his nephew Father Alexander Pitass. Father Pitass wanted to fullfill his uncle’s wishes and in 1914 the land was divided up and sold as lots for houses, with the exception of the center lot which he planned to make into a church. 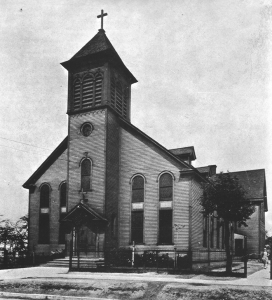 With readily available land, some Polish families moved into the area and by 1917 there were enough to transform the center lot into St. John Gualbert’s parish. Named after Dean Pitass’ patron saint, St. John Gualbert’s would become the center point for the Poles living in the area. Since the congregation was small, architect Wladyslaw H. Zawadzki presented the parish a simple church plan that was reminiscent of the original 1873 St. Stanislaus Church in Buffalo. To save money the school was attached to the back. For further savings on decorating the church, the walls of the interior were painted white so the stained glass could provide the color. With the parish fully established Father Peter Adamski was installed as the first resident pastor in 1918. As Cheektowaga developed, so too did St. John Gualbert. In 1921 a large influx of Polish families moved into the area and forcing an addition to the school. By 1925, Father Adamski had 450 families in his care and needed help managing the church. Relief came for the priest when he was assigned first Father Bronislaus Kowalewski and then Father Vincent Cyman. When the school had to be added to for the second time, Father Adamski knew a large footprint would be needed for the parish. On May 13, 1928, in front of a crowd of 4,000, ground was broken for a modern parish church. 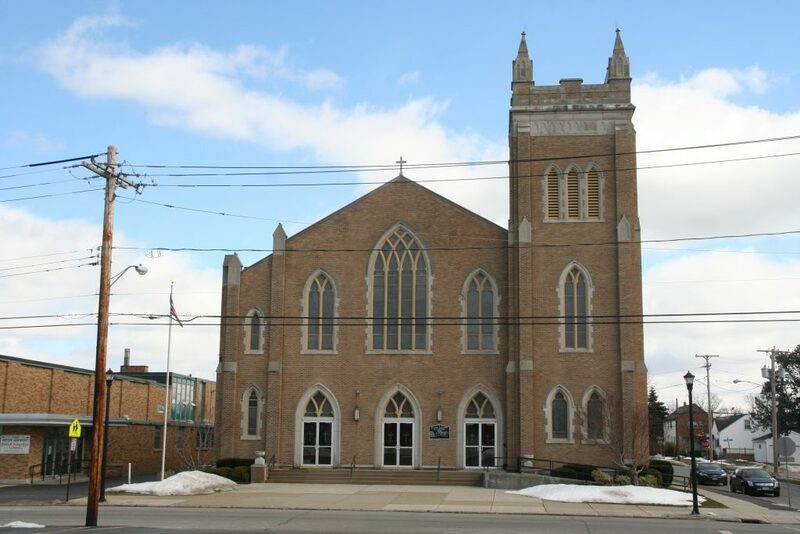 The Tudor Gothic inspired edifice with seating for 1,200 would cost the parish $200,000. One of the most striking features of the church is the stained glass. These windows of saints and blesseds were made by the S.G. Zelenski Studio of Krakow, Poland and are the only known set by the firm in the United States. Being a suburban church, the parish did not experience much of the decline Polish churches did in the 1980s and ‘90s. When the Monsignor Peter Adamski Polish Saturday School left the city, they settled at St. John Gualbert’s using the parish’s former school building. "800 Pay Tribute to Pulaski At Cheektowaga." Buffalo Courier-Express[Buffalo, NY] 7 Oct. 1929: 19. Print. "4000 See Ground Broken for Church." Buffalo Evening News [Buffalo, NY] 14 May 1928: n. pag. Print. Baltimore, Tereka. "St. John Gualbert May Be Only U.S. Church with Stained Glass Windows from Poland." Am-Pol Eagle [Cheektowaga, NY] 19 Apr. 2007: 1. Print. "Church to Celebrate 50 Years of Growth." Buffalo Courier-Express [Buffalo, NY] 27 Apr. 1967: 9. Print. "Education - Msgr. Adamski Polish Saturday School." The Am-Pol Eagle. Am-Pol Eagle Newspaper, n.d. Web. 21 Dec. 2015. Fronczak, Francis Eustace, Aleksander Pitass, and Mieczysław Haiman. "Ci, Którzy Do Pomogli Do Wydania Księgi Jubileuszowej - Wladyslaw H. Zawadzki." Księga Pamiątkowa Złotego Jubileuszu Osady Polskiej I Parafji Św. Stanisława, B. I M. W Buffalo, New York, 1873-1923. [Buffalo, N.Y.]: Nakładem Komitetu Wydawniczego, 1923. Print. Marszalek, John, ed. St. John Gualbert Cheektowaga, New York. N.p. : n.p., 1967. Print. The Windows of St. John Gualbert Cheektowaga, New York. N.p. : n.p., 1997. Print. Witul, Gregory. "The History of Polish Americans in Cheektowaga." Cheektowaga Historical Museum. Cheektowaga Senior Center, Cheektowaga, NY. 20 Feb. 2014. Lecture.